Birth* He was born on 2 February 1902 in Ballingrane, County Limerick, Munster, Ireland. 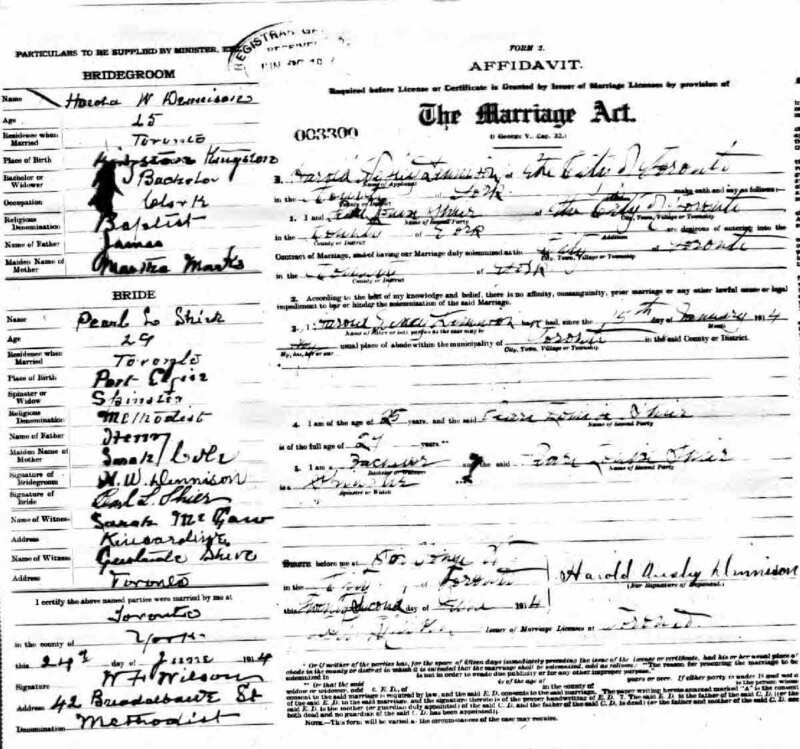 Marriage* Nicholas William Shier married Lily Frances Starke, daughter of Samuel Starke, on 16 September 1941 in Parish of Rathkeale, Holy Trinity Church, Rathkeale, County Limerick, Munster, Ireland. 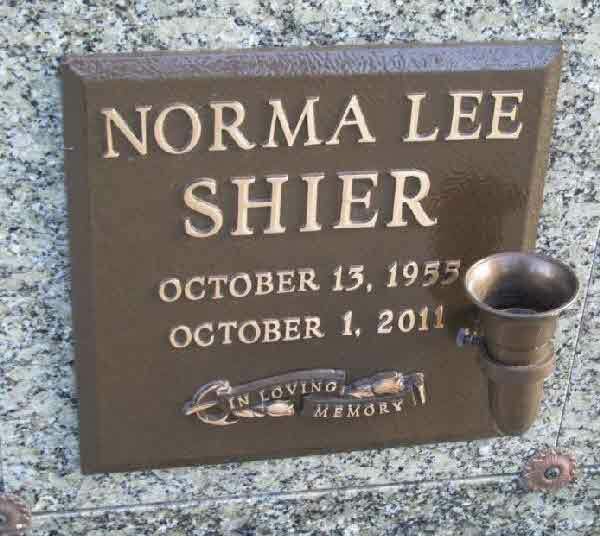 Burial* She was buried in Hillcrest Memorial Gardens, Saskatoon, Saskatchewan, Canada. 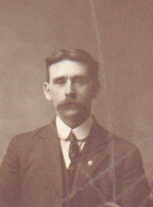 Death* He died on 3 January 1947 in York County Hospital, Newmarket, York County, Ontario, Canada, at age 62. Burial* He was buried in Cadillac Memorial Gardens West, Westland, Wayne County, Michigan, United States. 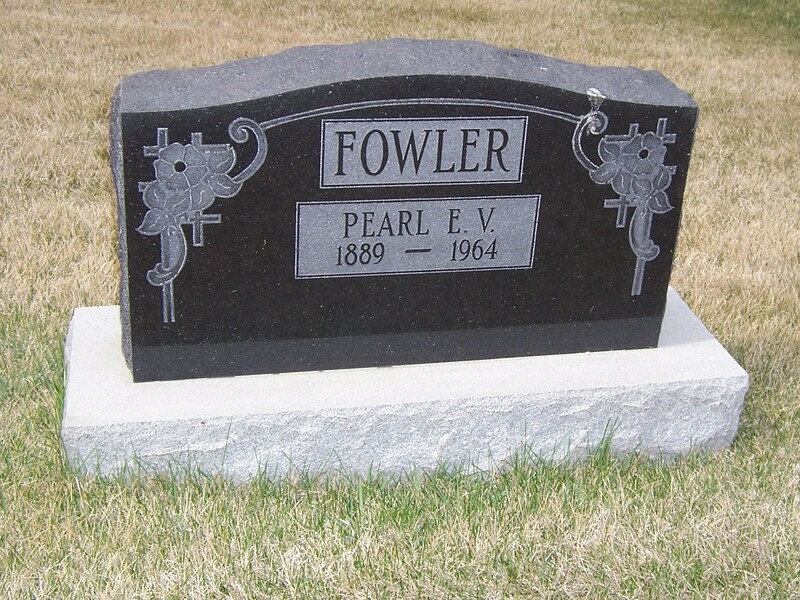 Burial* He was buried in Oxbow Cemetery, Oxbow, Saskatchewan, Canada. 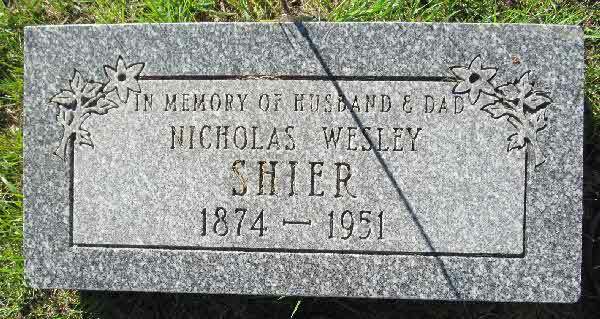 Birth* Norman Wesley Shier was born on 22 January 1906 in Scott Twp., Ontario County, Ontario, Canada. 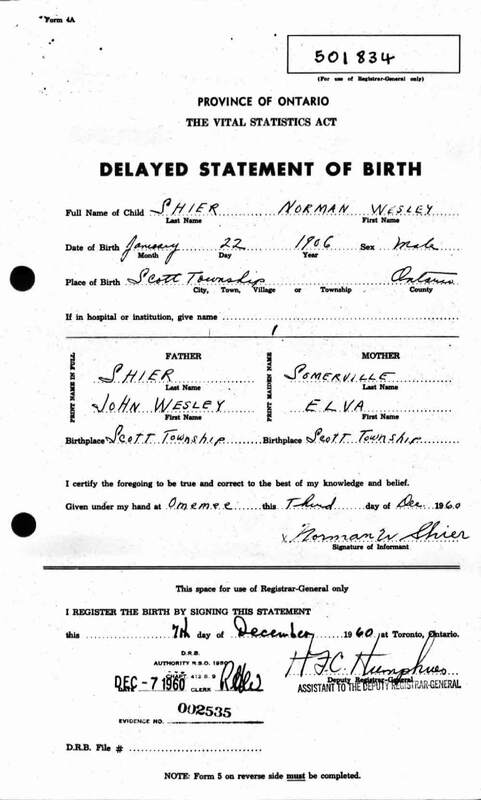 Marriage* Norman Wesley Shier married Margaret Donalda Grant, daughter of Donald Grant and Margaret Elizabeth Flett, on 19 December 1936 in Fenlon Falls, Victoria County, Ontario, Canada. 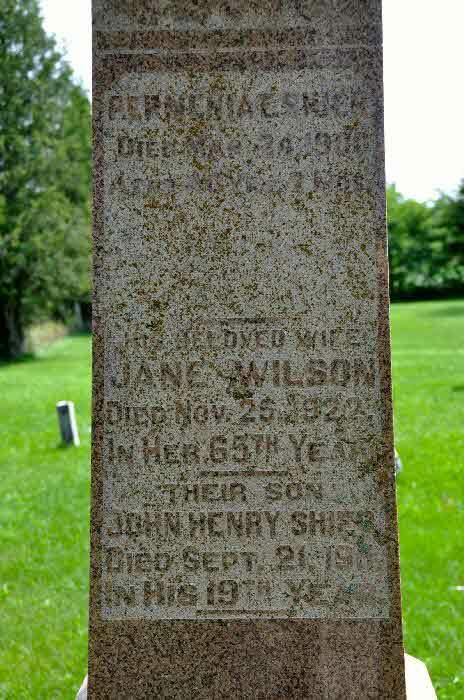 Burial* He was buried in Emily Cemetery, Omemee, Victoria County, Ontario, Canada. Death* Norman Wesley Douglas Shier died on 24 July 2011 at age 74. 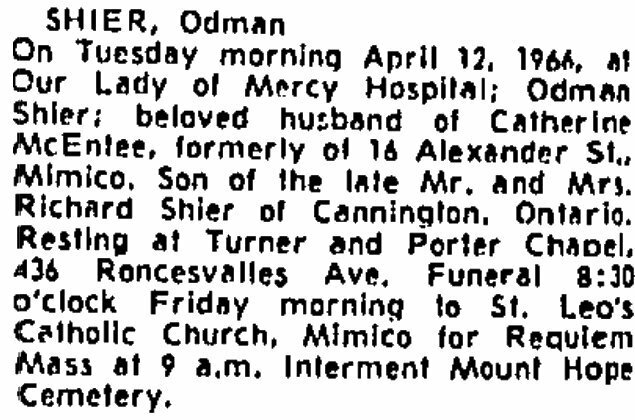 Birth* Odman Shier was born on 18 April 1886 in Brock Twp., Cannington, Ontario County, Ontario, Canada. 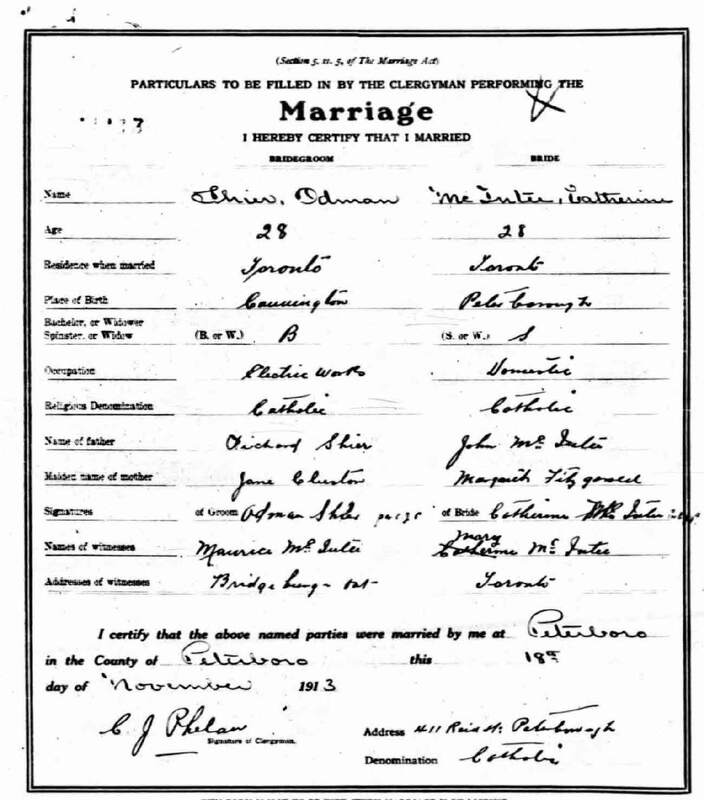 Marriage* Odman Shier married Catherine McIntee, daughter of John McIntee and Margaret Fitzgerald, on 18 November 1913 in Peterborough, Peterborough County, Ontario, Canada. Death* He died on 12 April 1966 in Our Lady of Mercy Hospital, Toronto, York County, Ontario, Canada, at age 79. 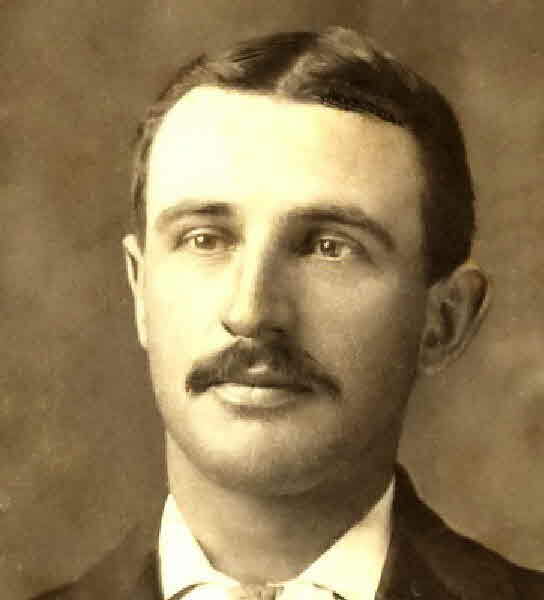 Birth* He was born on 7 May 1877 in Brock Twp., Ontario County, Ontario, Canada. Marriage* He married Ruth A. Lott on 29 September 1919 in Detroit, Wayne County, Michigan, United States. Burial He was buried in Uxbridge Cemetery, Ontario County, Ontario, Canada. 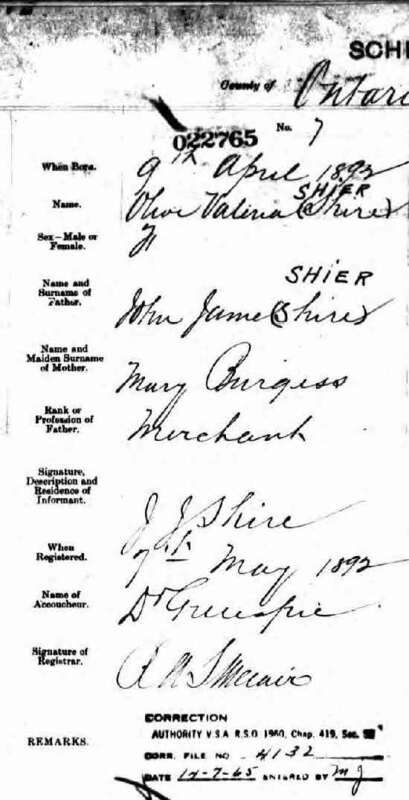 [S5] Ogle Shier entry, Death Registration - Ogle Shier, Brock Twp, Ontario County, unknown repository, unknown repository address. 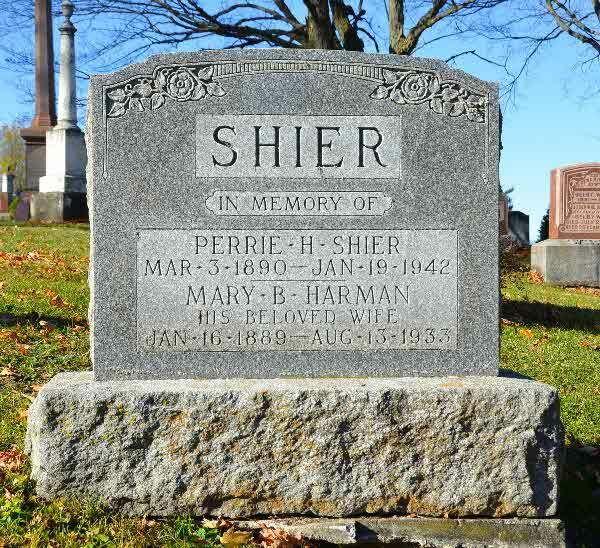 Hereinafter cited as Death Reg Ogle Shier. 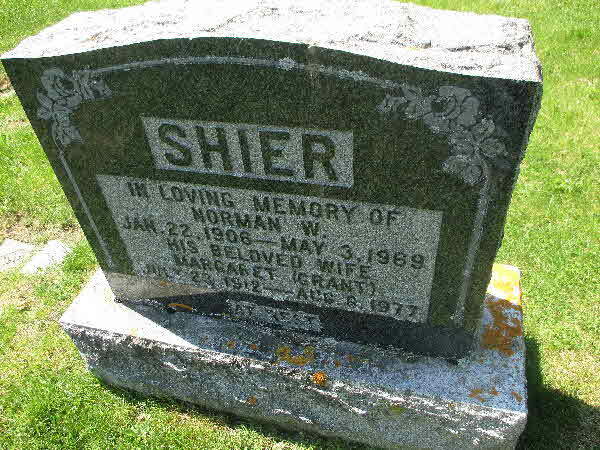 Birth* Olive Shier was born on 17 August 1915 in Ballingrane, County Limerick, Munster, Ireland. [S1] Ancestry.ca, online \Ancestry.ca\, Dorosh-Snell Family Tree. Hereinafter cited as Ancestry.ca. 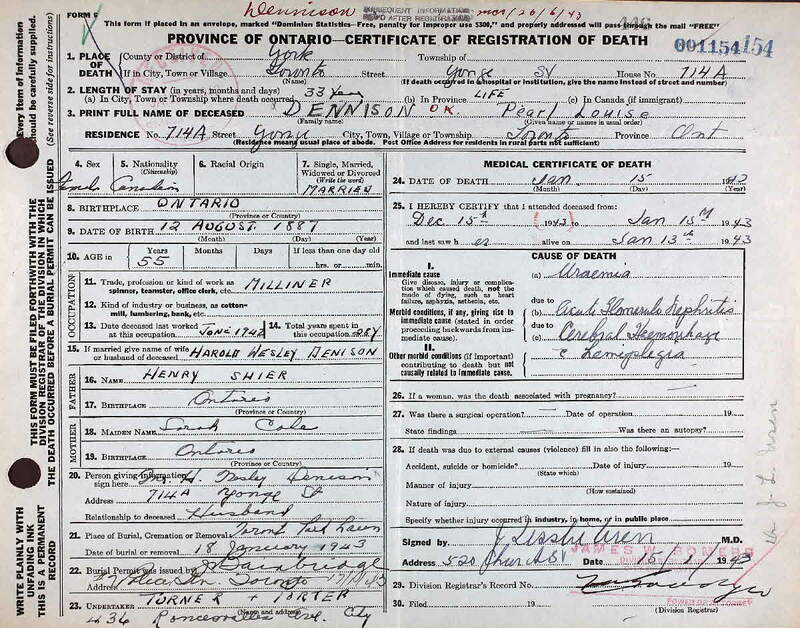 Birth* Olive Eliza Shier was born on 20 July 1898 in York County, Ontario, Canada. 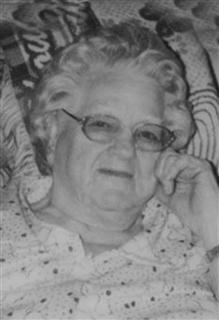 Birth* She was born on 9 April 1892 in Brock Twp., Cannington, Ontario County, Ontario, Canada. 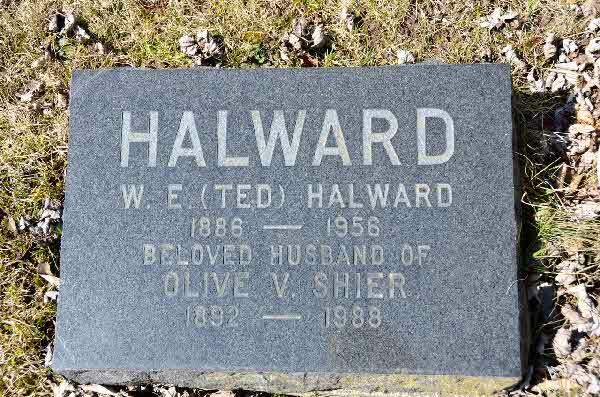 Marriage* Olive Gertrude (Valeria) Shier married Walter Edward Halward, son of Joseph Halward and Arabella Payne, on 16 August 1916 in Brock Twp., Cannington, Ontario County, Ontario, Canada. 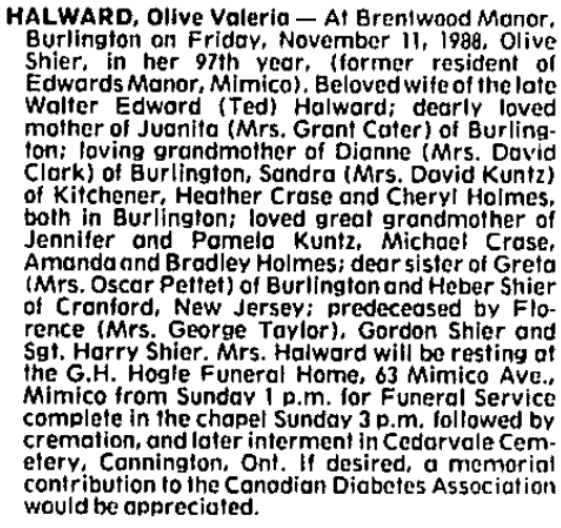 Death* Olive Gertrude (Valeria) Shier died on 11 November 1988 in Brentwood Manor, Burlington, Ontario, Canada, at age 96. Death* Olive Iona Shier died on 7 January 2014 in Lady Minto Hospital, Cochrane, District of Cochrane, Ontario, Canada, at age 84; In loving memory ofIona Schock (nee Shier)25th, 1929 – January 7th, 2014.
passed away peacefully with her family by her side after a life well lived at the age of 84 at the Lady Minto Hospital in Cochrane. Olive is survived by her children Joan (Denis) Turgeon, Charles (Mary) Schock, Patsy (Raymond) Cote, her grandchildren Paul (Sarah) Schock, Angela Schock (Rob Legrou), Derek Turgeon, Mitchell Cote, Paige (Charles) Recoskie, and Jordan Cote (Julie Gravel) and her great-grandchildren Jacob and Olivia Schock, her sister Jean Innes, her brother Fred Shier and sisters in law: Elaine Shier, Evelyn Shier and Isabelle Shier and will be fondly remembered by many nieces and nephews. 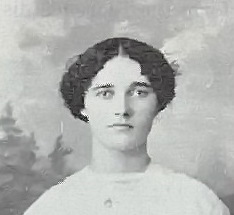 Olive was predeceased by her parents Charles and Bessie Shier, her husband Earl, her infant daughter Donna Lynn, an infant granddaughter Juliette Turgeon, her sisters and brothers in law, Thelma (Jack) Grant and Helen (Claude) Pender and her brothers and sisters in law Harry (Grace), Glen, Gordon (Rollande) and Bruce. Olive or Ollie as most of the family called her loved to knit, crochet, sew, read and fish! She was a member of the Legion for many years and served on the Ladies Auxiliary. Olive also was an avid knitter for the Canadian Red Cross and was responsible for the scarf that Chimo wears around his neck every winter! 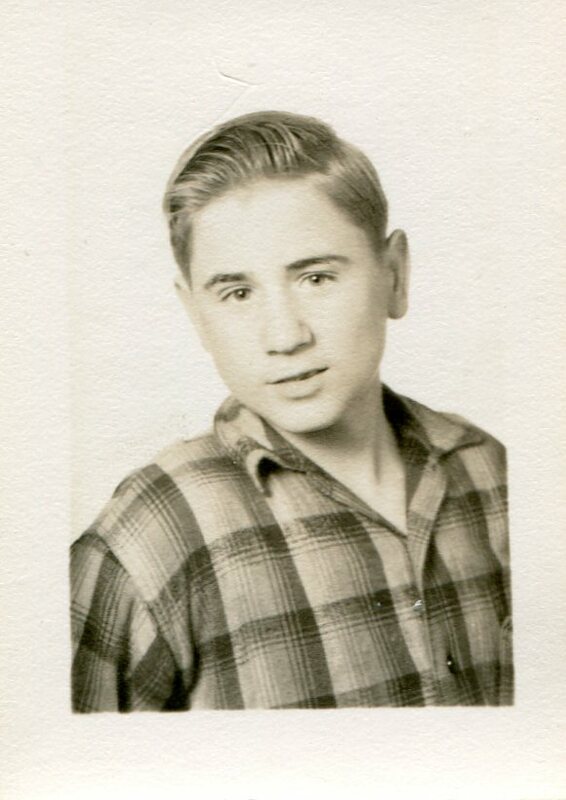 Olive loved music and she loved to dance…...Johnnie Reid, Stompin’ Tom, Tommy Hunter and the Beach Boys were among her favorites and she even got to attend a concert to hear them all live in person. 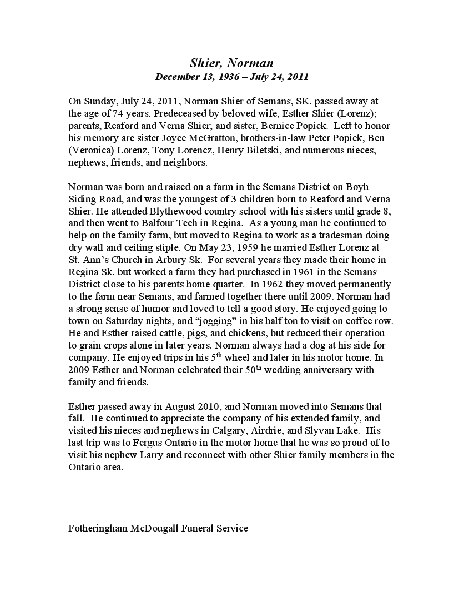 will be held at Irvine & Irvine funeral home, 149 Third Street West, Cochrane on Thursday January 9th, 2014 from 7 to 9 pm. 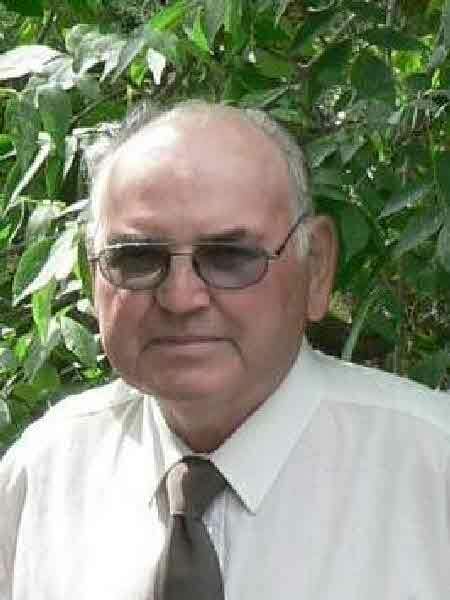 The funeral service will be held in the funeral home chapel on Friday January 10th, 2014 at 11 am with Reverend Paul Allard officiating. The burial will take place in the spring at the Cochrane Civic Cemetery. you wish to send online condolences to her family, to share your memories or photos of Olive, please visit www.irvineandirvinefuneralhome.com In lieu of flowers the family requests donations to the Lady Minto Hospital or to the Canadian Red Cross – Cochrane Branch and would be greatly appreciated. 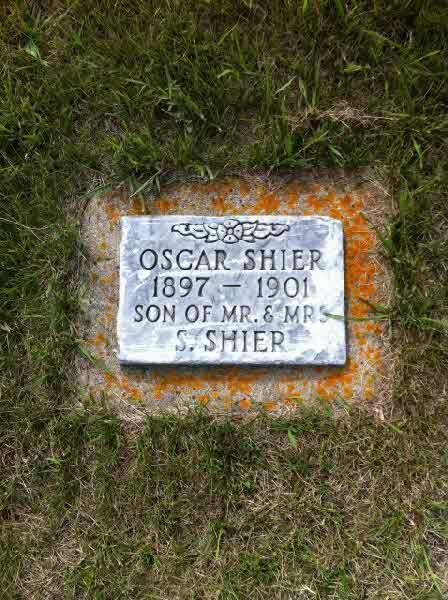 [S22] Unknown compiler address, Saskatchewan Vital Statistics, unknown repository, unknown repository address, Death Registration for Oscar Wilfrid Shier #206. 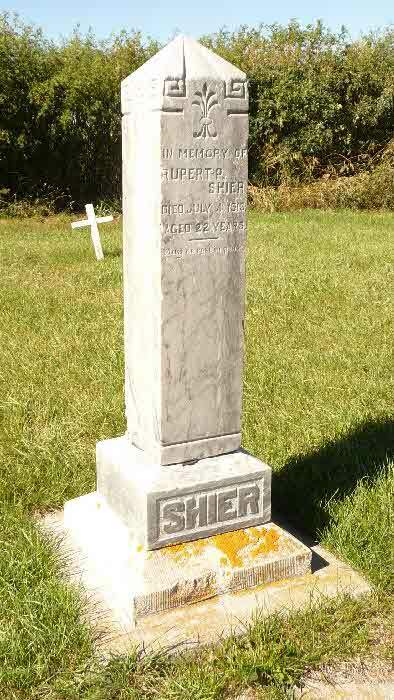 Burial* Otto S. Shier was buried in Longlaketon Cemetery, Silton County, Saskatchewan, Canada. [S56] Unknown household, unknown record type, unknown repository address, unknown repository. Death* Patricia A. Shier died on 12 July 2008 in St. Clare Hospital, Baraboo, Wisconsin, United States, at age 71; Winn Funeral Home Waunakee (608) 849-4513 Kratz, Patricia A.BARABOO - Patricia A. Kratz, age 71, of Baraboo, passed awayon Saturday, July 12, 2008, at St. Clare Hospital in Baraboo. 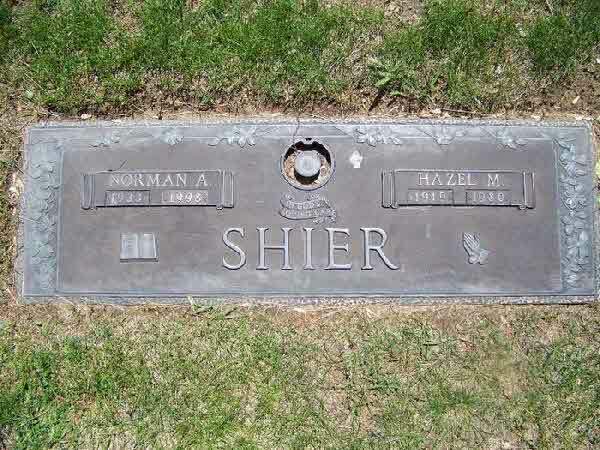 She wasborn on Sept. 27, 1936, in Milwaukee, the daughter of Ruben and Eleanor(Bean) Shier. 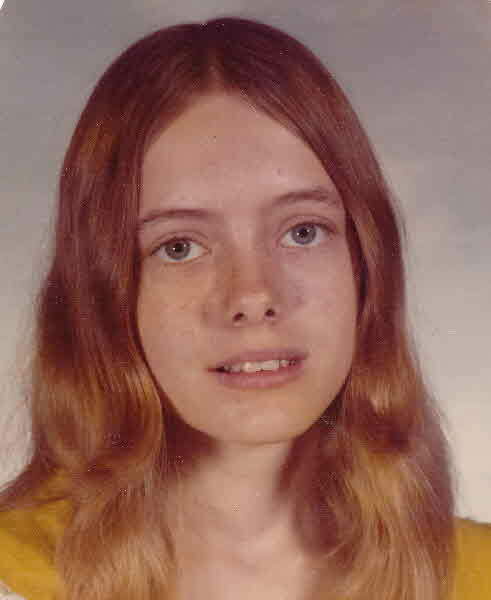 She was united marriage to Fredrick P. Kratz on Aug. 23,1968, in Montello. Patricia was a homemaker. She enjoyed gardening,knitting and crocheting. 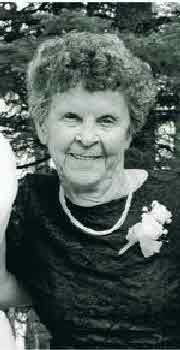 Her main goal in life was to take care of herchildren and grandchildren whom she loved dearly. She is survived byher two sons, Fredrick Kratz of Baraboo, and Dennis Kratz of Montello;three daughters, Catherine (Jeff) Peplinski of Baraboo, Mary Jo Kratz(Mark Keska) of Baraboo, and Rosemary Kratz (Jay Baxter) of Portage;three brothers, Walter (Kathleen) Shier of Menominee, Mich., Eugene(Bonny) Shier of Honey Creek, Wis., and Claude Shier of Portage; twosisters, Eleanor (Carl) Erdman of Princeton, and Ruth Evans of Washingtonstate; two sisters-in-law, Marsha Peterson of Waukesha, and PatriciaDixon of Merrill; 11 grandchildren, Troy, Logan, Luke, Jacob and TravenKratz, Zachary, Sonja and Nicholi Peplinski, Kaliey and Brandy Miller and Marissa; and a great-grandchild, Aiden Hart. She will also be missedby many other relatives and friends. 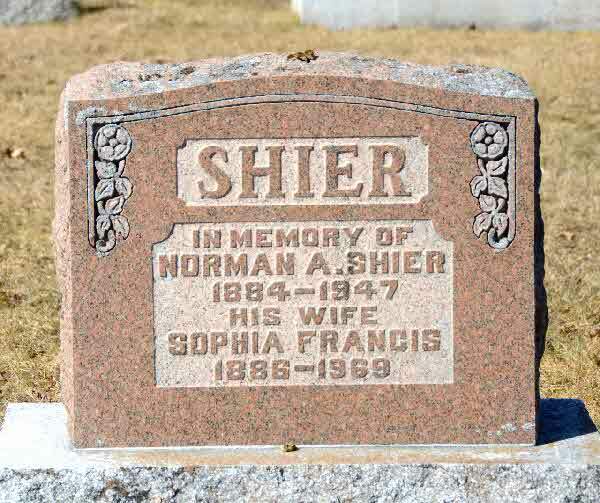 She is preceded in death by herparents; husband, Fredrick; three brothers, William Shier, Thomas Shier,and Butch Shier; and a sister-in-law, Florence Shier. Memorial serviceswill be held at 1 p.m. on Wednesday, July 16, 2008, at STEINHAUS-WACHHOLZFUNERAL HOME in Montello. Friends and family may visit at the funeralhome on Wednesday from 11 a.m until the time of service. Her body hasbeen cremated. Steinhaus-Wachholz Funeral Home in Montello, is handlingarrangements. 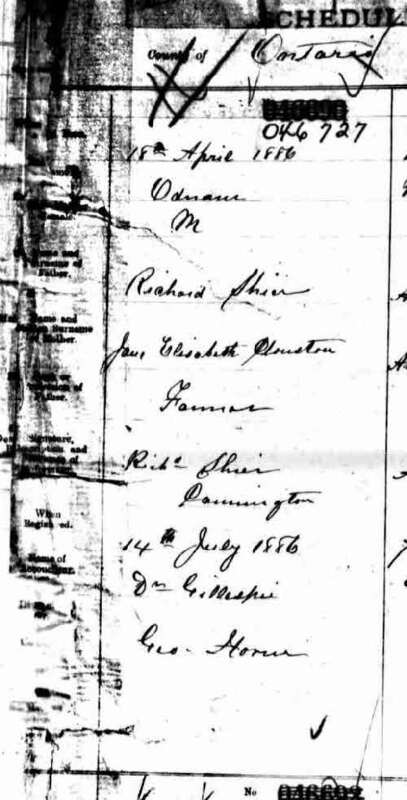 [S73] Ireland, Select Births and Baptisms, 1620 - 1911, online \, Birth of Patrick Shire, son of Christopher Shire and Ann. 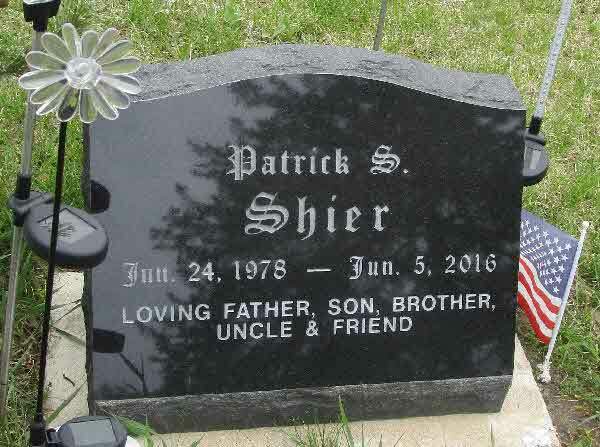 Death* Patrick Sherman Shier died on 5 June 2016 in Fort Winnebago, Wisconsin, United States, at age 37; Patrick Sherman Shier, 37, of Portage, died Sunday, June 5, 2016, as a result of a single-vehicle crash in the town of Fort Winnebago. 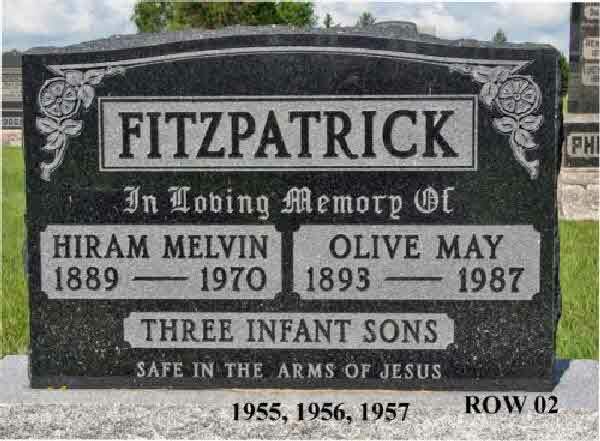 Patrick was born June 24, 1978, at Divine Savior Hospital in Portage, the third son of Elmore “Butch” and Patricia (Thomson) Shier. Weighing in at 11 pounds, 4 ounces (22 inches long), Baby “Fat Pat” soon became the family favorite, the “little” brother adored by all. His smile was contagious, his kind heart enormous, and his sense of humor renowned. 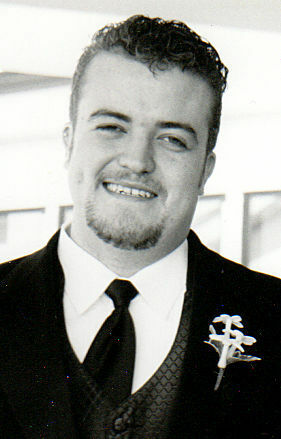 He graduated from Portage High School in 1996, and had most recently worked for Dawn’s Foods in Portage. He loved life, his family, and his three gorgeous daughters, often saying that they were the best thing he ever did. 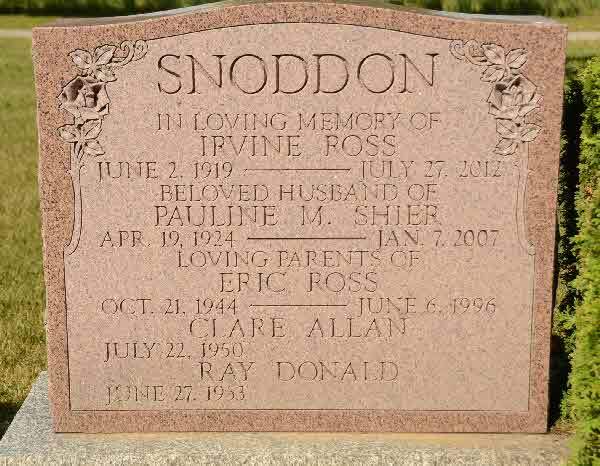 He is survived by his mother, Patricia (Jim) Dickson; his three daughters, Libby, Alyssa and Asia; his siblings, Brenda (Geoff) Adaire, Dean (Sue) Achterberg, Terrance Achterberg, Laura (Robert) Fredrick, Pamela Achterberg, Elden Shier and Thomas Shier; nieces, nephews, aunts, uncles and many cousins. 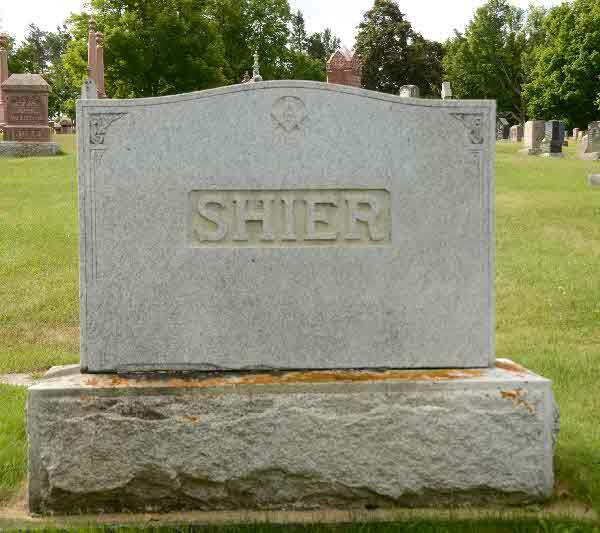 He was preceded in death by his father, Butch; his grandparents, Ruben and Eleanor Shier and Elden and Dorothy Thomson; and many aunts and uncles. A Celebration of Life will be held Wednesday, June 15 at Pflanz Mantey Mendrala Funeral Home in Portage, with visitation from 5 to 7 p.m., and a Sharing of Memories at 7 p.m. lnurnment will be private. In lieu of flowers, memorials may be made to Edvest College Savings Plan (college savings plans have been set up for each of his three daughters). The family would like to thank all relatives, friends and the entire community for their immense show of support and encouragement during this difficult time. 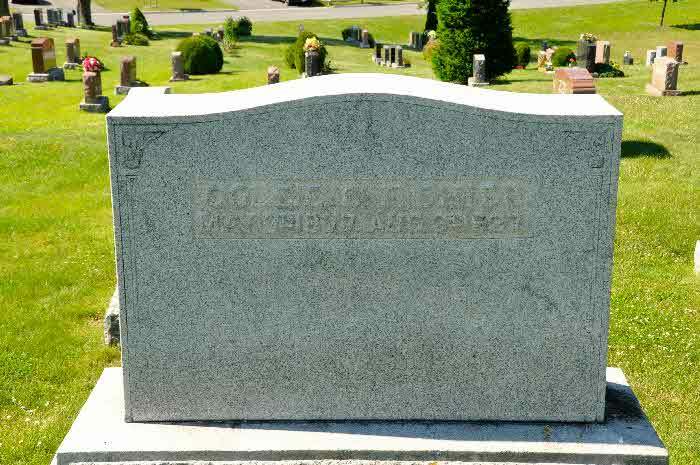 Burial* He was buried in Oak Hill Cemetery, Packwaukee, Marquette County, Wisconsin, United States. Death* Paul Adam Shier died on 15 November 2017; Suddenly, on Wednesday, November 15, 2017 at, age 69. 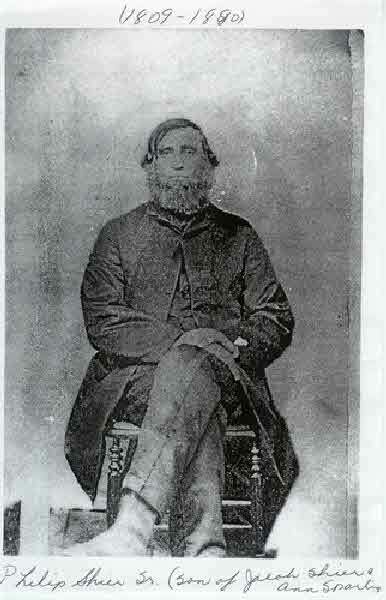 Paul Shier of Cannington, beloved husband of Brenda (nee MacGillivray). 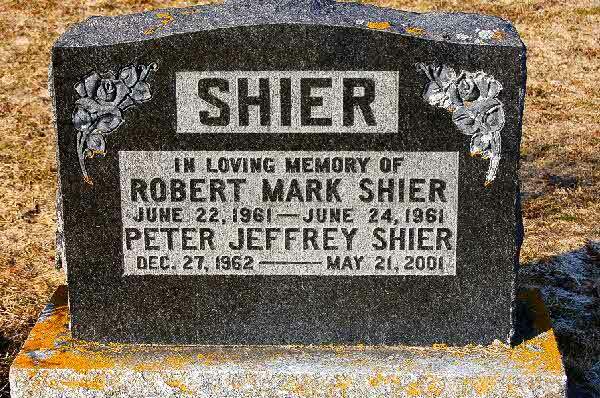 Loved father of Amanda Shier (Issam Bousraf) and Heather Shier. Loving grandfather of Sebastien (Bubba) Bousraf. 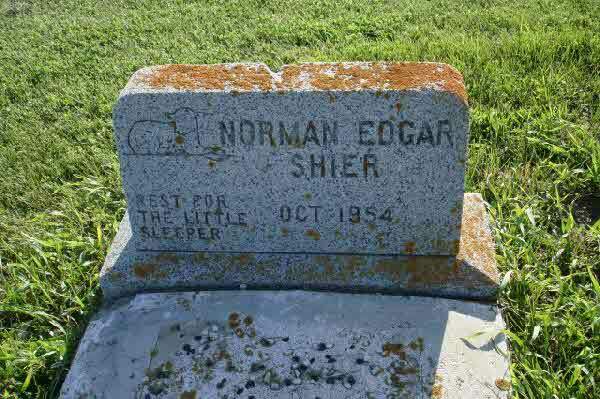 Predeceased by his parents Bob and Theda Shier. Dear brother of Gail (Paul Barton) and uncle of Robin (Scott Harper), Julie Prozenko (Barklee Perry) and Joe Barton (Brianne). Paul will be deeply missed by his dogs Bella and Geordi. The family will receive friends at the Cannington Curling Club, 95 Elliot Street, Cannington, on Saturday, November 25, 2017 from 1 – 4 pm. 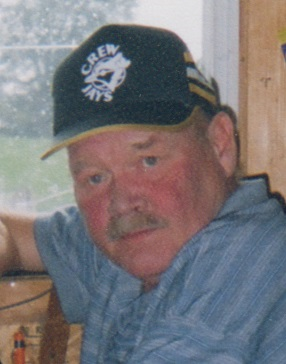 If desired, memorial donations may be made by cheque to the Ontario Federation of Anglers and Hunters or by calling 705-748-6324. 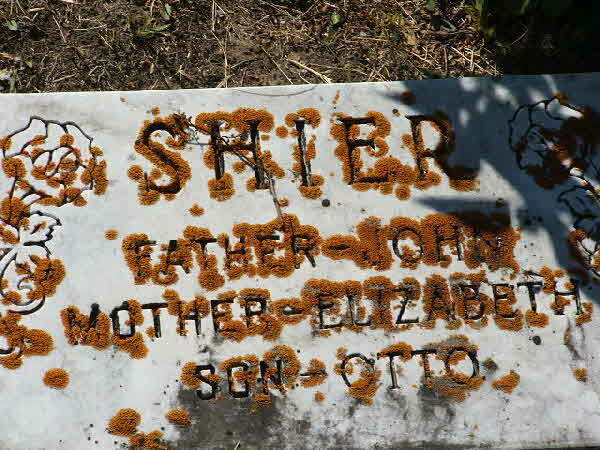 Burial* She was buried in IOOF (Odd Fellows) Cemetery, Grants Pass, Josephine County, Oregon, United States. Burial* She was buried in Acme Cemetery, Acme, Strathmore Census Division, Alberta, Canada. 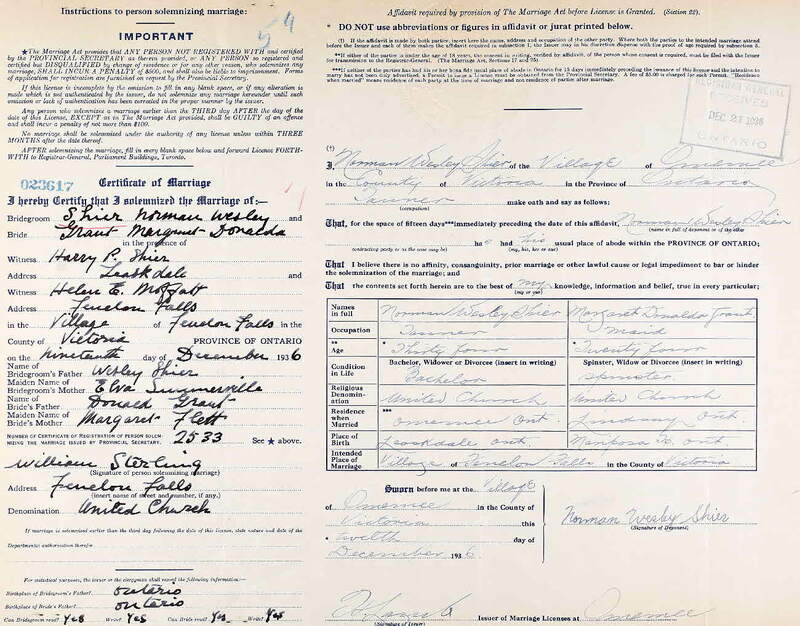 [S79] Alberta, Canada, Marriages Index, 1898 - 1942, online \. 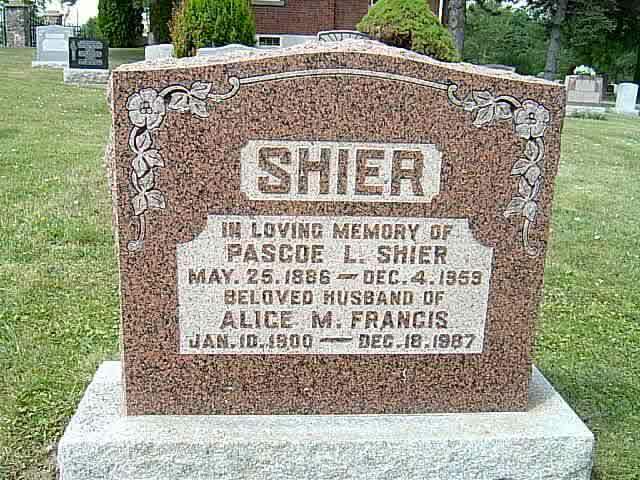 Marriage* Pearl Louisa Shier married Harold Wesley Dennison on 24 June 1919 in Toronto, York County, Ontario, Canada. 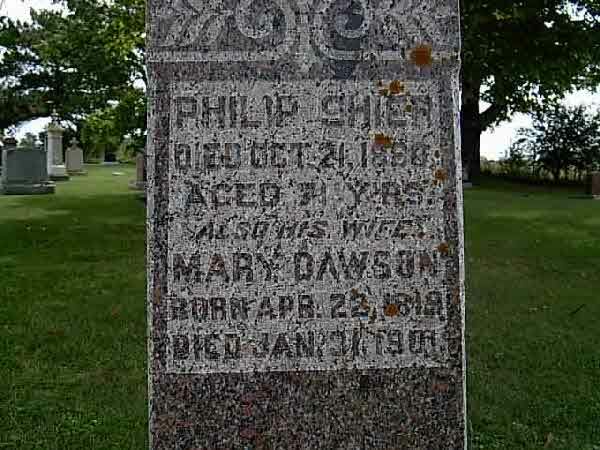 Death* She died on 15 January 1943 in Toronto, York County, Ontario, Canada, at age 57. 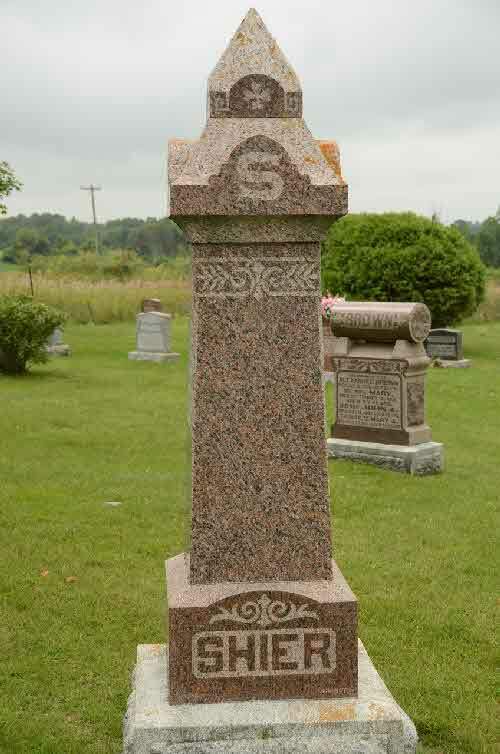 Burial* He was buried in Cayley Cemetery, Cayley, Calgary Census Division, Alberta, Canada. 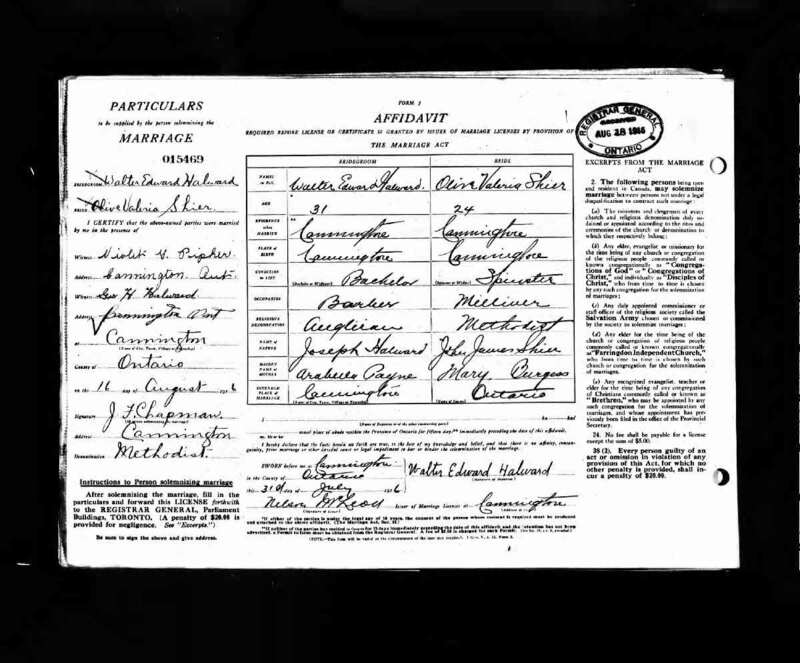 Marriage* Permenia E. Shier married Mary JANE Wilson, daughter of Issac Wilson and Martha Johnston, on 18 February 1892 in Vroomanton, Ontario County, Ontario, Canada; Reg Number 008992. 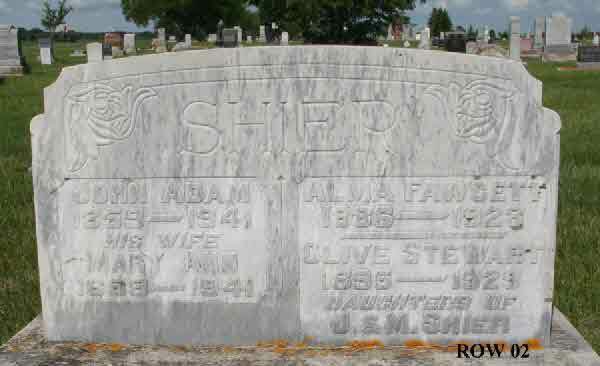 Death* Permenia E. Shier died on 24 March 1900 in Brock Twp., Ontario County, Ontario, Canada, at age 40. 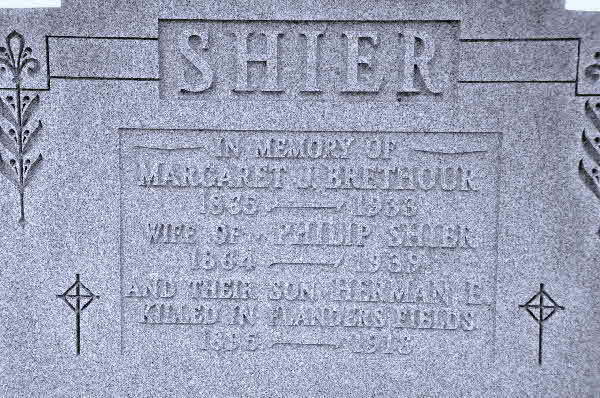 Marriage* Philip Shier married Margaret Jane Brethour, daughter of Arnold Brethour and Margaret Ann St. John, on 10 January 1888 in Brock Twp., Ontario County, Ontario, Canada. 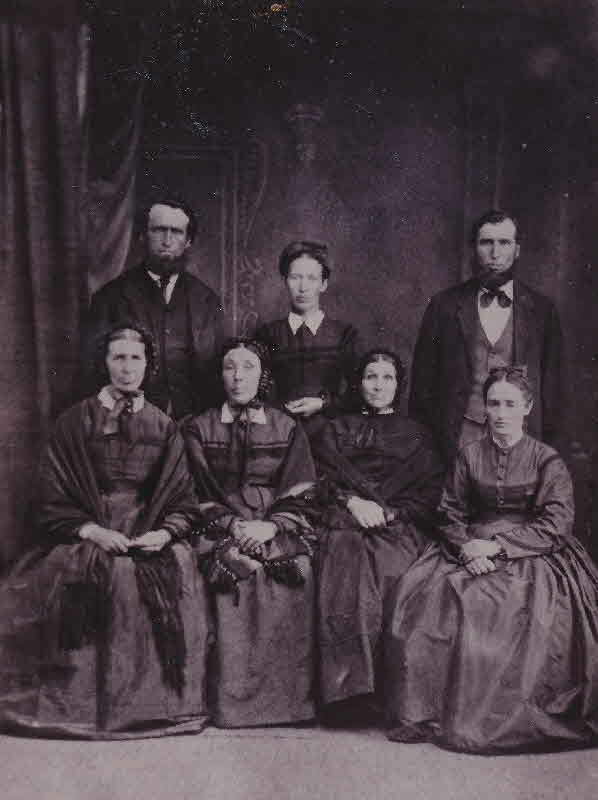 Front Row L. to R.
Fact 1 Photo of 7 of Jacob Shier's and Anne Sparling's Family. 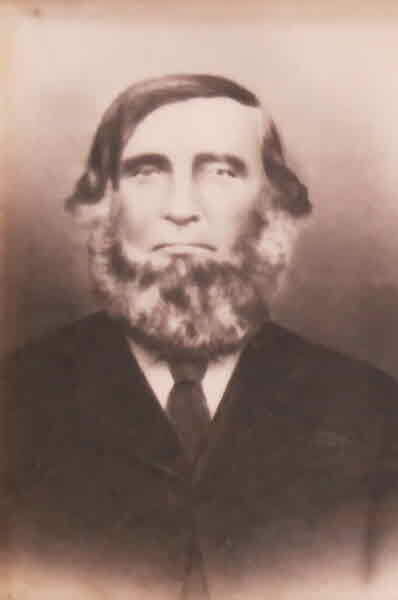 Death* He died on 21 October 1880 in Cannington, Ontario County, Ontario, Canada, at age 71.